For additional information, see the original album. The Canadian release of the CD has altered cover graphics. Despite the catalog number, this is a reissue of CL 1493, not CS 8637. All of the tracks are in mono. This is one of those early CDs that flooded the market at the dawn of the digital age which simply converted a long-standing vinyl LP to the new format to take advantage of the novelty. Minimal tracks (usually 10 to 12 but some with as few as 8) and a complete lack of liner notes and contents discography were the norm. And this one is no exception. And even as a vinyl LP in the early 1960s the title was totally incorrect because half of the cuts were not among his "greatest hits" - certainly not if you consider a "hit" something that made the national Billboard charts. Of the six hits that are here, some are among the best of their day, beginning with the opening track. The Theme From "A Summer Place" from the film starring Troy Donahue and Sandra Dee shot to # 1 on the Billboard Pop Hot 100 early in 1960 and spent NINE weeks at that position b/w Go-Go-Po-Go on Columbia 41490. It even made a significant impact on the R&B charts, reaching # 2. Track 3, Till, was among his lesser hits, only managing a # 63 in the spring of 1957 on Columbia 40826 b/w The Last Dance, while Delicado was his initial # 1, hitting that top spot in the spring of 1952 featuring Stan Freeman on the harpsichord on Columbia 39708 b/w Festival. And the very next track, The Song From Moulin Rouge (Where Is Your Heart? ), even outdid A Summer Place, spending TEN weeks at # 1 in May/June 1953. featuring the lovely voice of Felicia Sanders on Columbia 39944 b/w Swedish Rhapsody (Midsummer Vigil), which also charted at # 21 (track 12). All My Love, adapted from the French song Bolero, became the second hit single for the Canadian-born orchestra leader when it reached # 7 in the fall of 1950 on Columbia 38918 b/w This IS The Time. But that's it insofar as his "greatest hits" are concerned when it comes to this release. They Can't Take That Away From Me was released twice without becoming a hit, the first time in 1950 b/w If I Had A Magic Carpet on Columbia 38862, and again in late 1953 as the flip of Non Dimenticar (which also failed to chart by the way) on Columbia 40155. Other failed singles include Jamaican Rhumba, which also was issued twice in 1952, first on Columbia 39784 b/w Oye Negra, and then on Columbia 39790 b/w Da Du, and Tropical Merengue which was a 1955 release b/w We Won't Say Goodbye on Columbia 40543. The Syncopated Clock WAS a 1951 hit, but for Leroy Anderson as well as The Boston Pops Orchestra. Percy's rendition was the uncharted flip of the # 10 hit On Top Of Old Smoky, with vocal by Burl Ives on Columbia 39328. Similarly, The Rain In Spain, from My Fair Lady, was the uncharted B-side to the # 82 minor hit, With A Little Bit Of Luck (also from My Fair Lady) in summer 1956 on Columbia 40696. Neither of those hits is included. Other legitimate hits overlooked when the album first came out were: his first, I Cross My Fingers, with vocal by Russ Emery which reached # 20 in July 1950 b/w Valencia on Columbia 38786; Christmas In Killarney with The Shillelagh Singers, a # 28 in December 1950 b/w Norah on Columbia 39048; the double-sided hit When The Saints Go Marching In (# 29) b/w I Want To Be Near You (# 30) on Columbia 39528 in September 1951; Return To Paradise - Parts 1 & 11, a # 19 in June 1953 on Columbia 39998; Many Times, a # 30 in December 1953 b/w In Love on Columbia 40076; Drea, Dream. Dream - a # 25 in May 1954 b/w Eleanora on Columbia 40185; The Bandit, from the Mexican film O Cangaceiro, a # 25 in October 1954 b/w Rainfall on Columbia 40323; Valley Valparaiso, a # 53 in February 1956 b/w Bluebell on Columbia 40633; We All Need Love, a # 67 in April 1956 b/w Carmellita on Columbia 40644; and Theme For Young Lovers, a # 35 in June 1960 b/w Bimini Goombay on Columbia 41655. 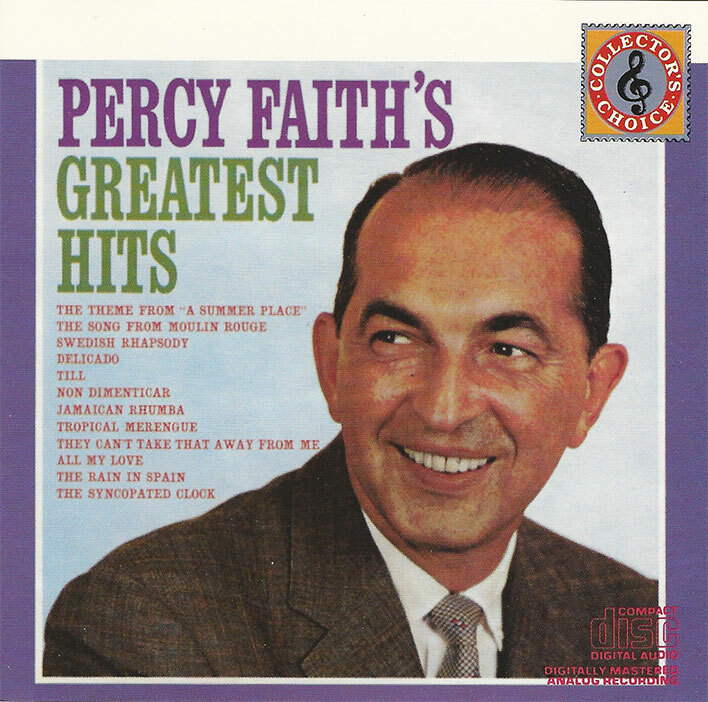 With the advent of the Adult Contemporary charts in late 1961, Percy would go on to add another nine to those charts from 1967 to 1975. He passed away the following year at age 67. My suggestion would be to look around for more recent compilations which contain most, if not all, his early hits shown above. And if you're interested in knowing what those Adult Contemporary hits were, I have provided a list in the comments section.